RIDICULOUS! 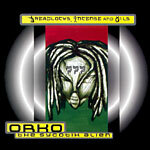 This is one of Orko's dopest CD's! The production, the content, & of course the Rap's are Sharp. Not afraid to break the boundaries between Drum&Bass and Hip-Hop, Orko flips his style all over the place. San Diego's Finest. All tracks produced by Orko except track 1 by AdLiB and track 17 by Godschild. Interludes by Lord Jaweg (the Peddler).